Millbrook Gardens has extensive experience building a wide range of natural stone design elements. 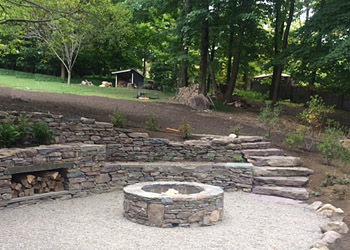 Built to last with locally sourced materials, stone walls are not only functional, but also beautiful features of any landscape. Whether the construction is dry-stacked or mortared, they are built with the utmost attention to structural integrity while staying true to the local style. What better place for outdoor entertaining than your very own Fire Pit?! Create a gathering space for a quiet intimate evening or a raucous party. Roasting marshmallows never goes out of style. Enjoy the journey along a curved or straight set of steps and see where it leads. Steps can be built from a wide variety of materials to meet the needs of the landscape while functioning safely.